Home / Christian News / Motivation / Is The Driver Your Father? Is The Driver Your Father? A boy stood on a sidewalk waiting for a bus. A man walking by spotted the boy and gave him some gentle instruction. "Son," he said, "if you're waiting for the bus you need to move to the street corner. That's where the bus stops for passengers." "It's OK," said the boy. "I'll just wait right here and the bus will stop for me." The man repeated his argument, but the boy never moved. Just then, the bus appeared. Amazingly, the bus pulled over to where the boy stood and he hopped on. The man on the sidewalk stood speechless. 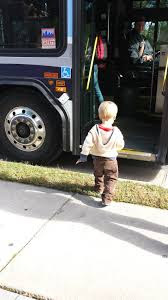 The boy turned around in the doorway and said, "Mister, I knew the bus would stop here, because the bus driver is my dad!" Whether you are unemployed, broke, single or married, or childless or widowed. 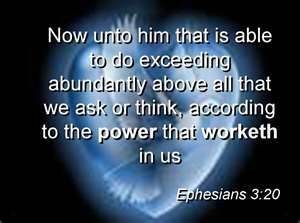 What matters is that you know Him who is able to do exceedingly abundantly above what we can think or even imagine. However, the BIG question is : "Is the Driver your Father?" "Are you (still) His child? You can only get that privilege if He is your Father.